Do Not Pray To Fulton Sheen, Just Yet. "In March, a seven-member board of physicians convoked by the Congregation for the Causes of the Saints agreed that there was no natural explanation for why the child’s heart started beating over an hour after his birth. The child, James Fulton Engstrom, is now three years old and developing normally. His mother, Bonnie Engstrom, said she had no precomposed prayer asking for help from Archbishop Sheen. 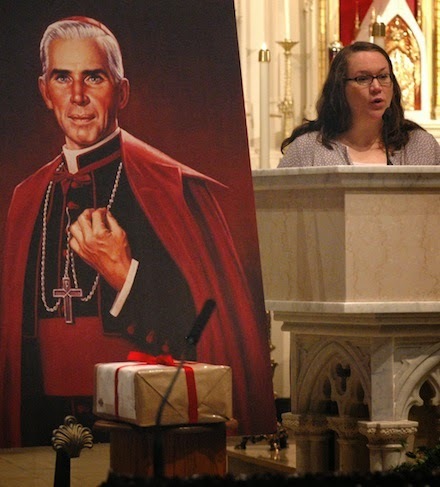 “I just kept repeating his name over and over in my head: Fulton Sheen, Fulton Sheen, Fulton Sheen,” said Ms Engstrom." Q. 30. Do such then believe in Jesus the only Saviour, who seek their salvation and welfare of saints, of themselves, or anywhere else? (b) Heb.12:2; Isa.9:6; Col.1:19,20; Col.2:10; 1 John 1:7,16. The argument being proposed is that the Reformed believe Christ now has a body that can only be in one place at a time, so he cannot be physically present in the Eucharist. Hence the Reformed commit heresy by dividing the two natures of Jesus (or limiting the divine nature of Jesus). Calvin mistranslated Acts 3:21 in the 1599 Geneva Bible using the word "contain" rather than "receive," thus locating Christ only in Heaven and therefore denying his presence in the Eucharist. What's blatantly right about this argument is that the Reformed who historically follow in the footsteps of Calvin do indeed hold that the human body of Christ is in Heaven and therefore not physically present in the Lord's Supper. What's blatantly wrong about this argument is that Calvin did not translate the Geneva Bible of 1599. It would be enough to leave this here, but there are some other historical and theological factors that need to be addressed. The Book of Concord on "Receive"
Note how The Book of Concord says part of the translating error is "received" while the CARM Lutheran argument at the top of this entry says "received" is the correct translation! Then in its place, The Book of Concord would rather the translation be, "Christ must take possession of heaven." If the charge of creating an English version to comply with theological paradigms is to be applied anywhere, it seems to me this Lutheran translation of Acts 3:21 is a more fitting example. 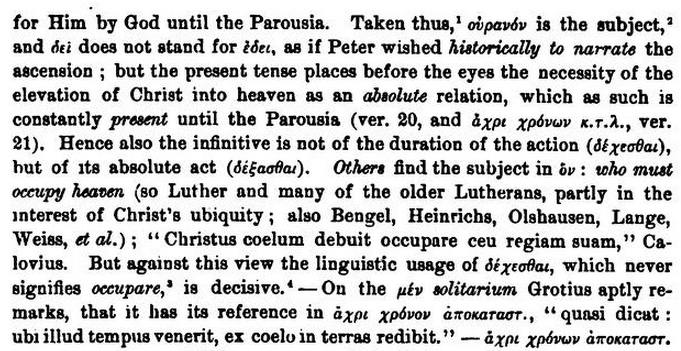 The Lutherans argue that "Christ" is the subject of the sentence, so "Christ must take possession of heaven." 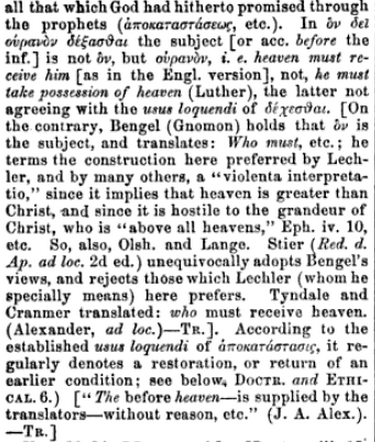 The Reformed say "heaven" is the subject of the sentence. so “Christ must be received by heaven.” Grammatically, either is possible. Of the major English versions I checked, none follow the Lutheran grammatical structure- even with some putting forth "He must remain in heaven" which undercuts the Lutheran argument (see this parallel web-page, and also this parallel web-page for examples of English translations of Acts 3:21). Calvin, the Geneva Bible, and "Must Contain"
21. Whom the heaven must contain. Because men’s senses are always bent and inclined towards the gross and earthly beholding of God and Christ, the Jews might think with themselves that Christ was preached, indeed, to be raised up from the dead, yet could they not tell where he was; for no man did show them where he was. Therefore Peter preventeth them, when he saith that he is in heaven. Whereupon it followeth that they must lift up their minds on high, to the end they may seek Christ with the eyes of faith, although he be far from them, although he dwell without the world in the heavenly glory. But this is a doubtful speech; because we may as well understand it that Christ is contained or comprehended in the heavens, as that he doth comprehend the heavens. Let us not therefore urge the word, being of a doubtful signification; but let us content ourselves with that which is certain, that we must seek for Christ nowhere else save only in heaven, whilst that we hope for the last restoring of all things; because he shall be far from us, until our minds ascend high above the world. The Lutheran charging Calvin with error appears to not realize that Calvin did not write this in English. This English translation is from Christopher Featherstone, 1585 (made not that long after Calvin's death, 1564). Henry Beveridge edited it and updated the English in 1844. Beveridge's English version of Featherstone is what is popularly found today. 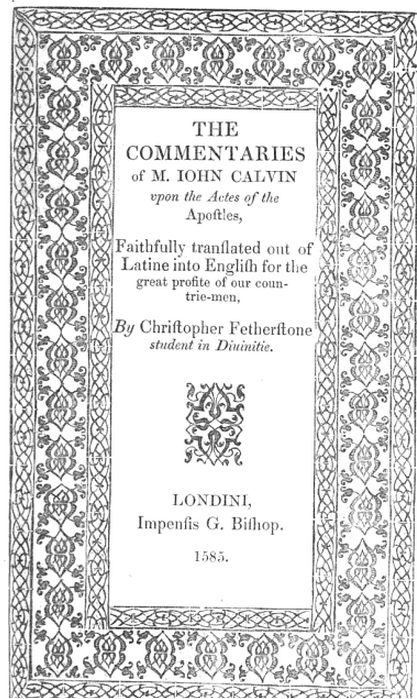 In fact, as far as I can tell, Featherstone's (Beveridge) translation is the only complete English translation available of Calvin's Commentary on Acts (For an interesting look at Featherstone, see this link). Could it be simply that Featherstone was familiar with the Geneva Bible's rendering of Acts 3:21 when he translated Calvin's Latin? The entire Geneva Bible was published in 1560. Could this be the simple reason Calvin is translated as saying "must contain"? The first thing I did was check the Latin version of Calvin's comments on Acts 3:21. Corpus Reformatorum vol. 48 reads, Quem oportet coélum cape, which is literally something like, "whom the heaven must take" (p. 72). Earlier Calvin offers the following translation of Acts 3:21, "quem oportet coelum capere usque ad tempora restitutionis omnium, quae loquutus est per os omnium sanctorum prophetarum a sacculo." The phrase in question is something like "He must get to heaven." The idea is that Christ is to be received and taken into Heaven. In Latin, "Take" and "contain" both have capere as an equivalent. Capere is the present infinitive of "capio." 1. I capture, seize, take. 3, I take in, understand. According to this source: "To take in, receive, hold, contain, be large enough for"
All this being said, the English translation of "must contain" is within the realm of possibility for the Latin, but does not appear to be the most concise rendering. This old source cites Wescott (who cites P. Cotton) noting "three or four instances of unfair bias in favor of Calvinistic doctrine in the English Genevan Version." Acts 3:21 is used as an example for "must contain" and this "unfair bias." For as we do not doubt that Christ’s body is limited by the general characteristics common to all human bodies, and is contained in heaven (where it was once for all received) until Christ return in judgment [Acts 3:21], so we deem it utterly unlawful to draw it back under these corruptible elements or to imagine it to be present everywhere (Institutes, IV,xvii,12). Calvin Mistranslated the Greek Text With His Latin? 8. Again, when it is taught, that Christ, in consequence of his ascension to heaven, is so contained and circumscribed with his body, in a certain place in heaven, that with it he neither can nor will be truly and essentially present with us in the holy Supper, which is celebrated here on earth according to the institution of Christ, but that he is as far, or distant from it, as heaven and earth are from each other; as some Sacramentarians, for the confirmation of their error, have willfully perverted this text, Acts 3, 21: Oportet Christum caelum accipere; that is, It behooved Christ to receive the heaven; and instead of this translation, they have rendered it; Oportet Christum caelo capi; that is, It behooved Christ to be received by or in the heaven, or to be circumscribed and contained in heaven, so that he neither can nor will be with us on earth in any manner with his human nature [source] (alternate source). Calvin probably began his Acts commentary in 1550, because by November of 1550, he had a large part of it finished. The commentary on chapters 1-13 were published in 1552. Chapters 14-28 came out in 1554. According to T.H.L. Parker's study of Calvin's commentaries, Calvin relied on the Greek texts available to him at that time. 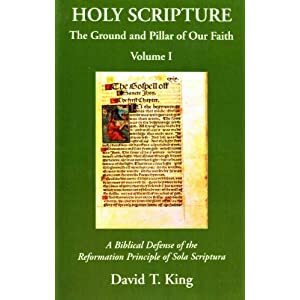 Parker notes, "he favoured a literal translation, even to the extent of preserving the word order where no difference between Greek and Latin forbade it" (Parker, Calvin's New Testament Commentaries, p. 134). For a complete breakdown of the Greek texts thought to have been utilized by Calvin see Parker, chapter 6: "The Greek Text." Calvin therefore did not prefer a Latin reading over the Greek text. It is believed Calvin did consult the Vulgate and the Latin text put together by Erasmus, but primarily his Latin translation was his own, directly from the Greek. Parker says Calvin's Latin text "has therefore a decidedly eclectic character" (Parker, Calvin's New Testament Commentaries, p. 190). For Acts 3:21 the Vulgate has "quem oportet caelum quidem suscipere" (whom the heaven must receive). Erasmus has "que oportet quide coelu accipere" (which is what heaven must receive). Calvin has "quem oportet coelum capere. "It appears Calvin did not literally follow either the Vulgate or Erasmus, but this doesn't imply there was devious Latin from Calvin's pen perpetuating translation bias. See Addendum #2 below for exegetical considerations as to why the Latin Lutheran rendering is to be rejected. 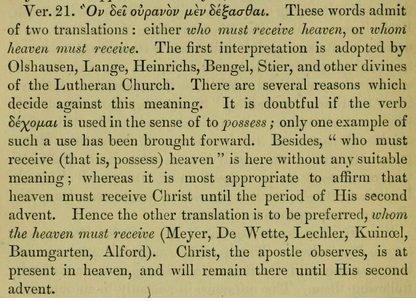 The question I would pose in response to the initial Lutherans argumentation is why is their translation "It behooved Christ to receive the heaven" or "Christ must take possession of heaven" not the preferred English translation? Would Lutherans be willing to argue for a cross-denominational translation conspiracy? [As an interesting aside, the NIV 1984 translates the passage as, "He must remain in heaven until the time comes for God to restore everything...," whereas the 2011 NIV states "Heaven must receive him until the time comes for God to restore everything..."]. 1. Calvin did not translate the Geneva Bible of 1599. Certainly his was a great influence to it, but he did not translate the Geneva Bible (of any edition). 2. "Whom the heaven must receive" is not at odds with either Calvin or the Reformed tradition, but is a translation opposed to the Lutheran confessions. The Lutheran confessions are clearly opposed to it, offering instead their own curious English rendering which is at odds with the majority of English translations present today. 3. "Whom the heaven must contain" is probably an inferior English translation and appears to indicate a Reformed bias (though "contain" is within the realm of meaning). 4. Calvin did not mistranslate Acts 3:21 from Greek to Latin in his commentary on Acts 3:21. The argumentation of Chemintz can be found here (see page 68). Here are a few grammatical treatments of Acts 3:21. I plan on updating this as I come across sources. 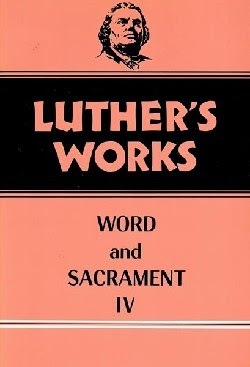 The only in-depth modern Lutheran grammatical treatment I'm aware of is that put forth by Francis Pieper: "As Pieper has pointed out, the Reformed “falsified the words” (SD VII, 119) by taking the Dexasthai as a passive instead of a middle voice; expressed in Christ was enclosed and circumscribed in heaven. For a detailed discussion of this text, see Pieper II,326–328." I do not have access to this volume yet. I'm speculating there are other Lutheran exegetical sources- perhaps my readers can provide me with some additional sources. 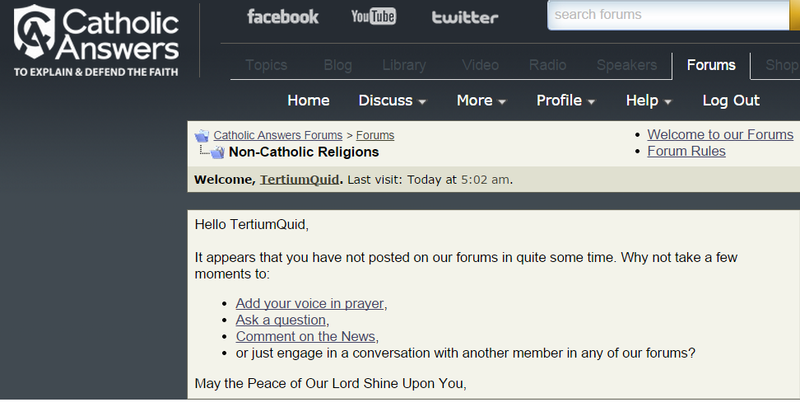 Thanks so much for this friendly reminder, but perhaps you've forgotten you've suspended TertiumQuid for a month? Luther and Zwingli Had to Admit Mary's Perpetual Virginity Before the Marburg Colloquy? James,Could you help me find a quote online that I am quite sure I read in a book about 30 years ago? At the Marburg Cooloquy where Luther and Zwingli argued about the Real Presence, before the fireworks began, both men had to prove they had an orthodox understanding of scripture by agreeing that Mary was a Perpetual Virgin despite the term "brother". I may not have it 100% correct but I think I am close. I have googled for it but to no avail. Are you familiar with this? Could you post it or email it? Thanks. I don't recall ever hearing this before, but it sounded intriguing enough to look into. My suspicion is that the thirty-year old memory may refer to something from The Marburg Colloquy and the Marburg Articles (1529) [LW 38:3]. Luther came face to face with Zwingli in 1529 at Marburg. In doing some digging into the history of Calvin's Commentaries, I came across a complete pdf of Calvin: Commentaries The Library of Christian Classics Volume XXIII. 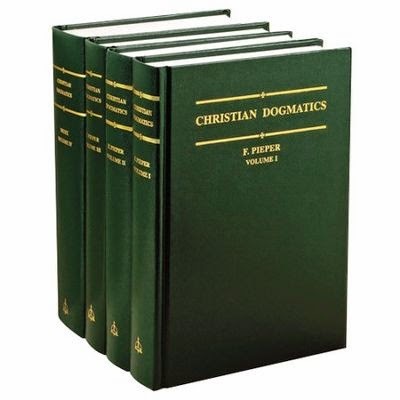 The library of Christian Classics is a 26 volume set put out by Westminster John Knox Press, Presbyterian Publishing. "The older translations are from the hands of a number of scholars. Their English styles are different, and not of the same quality. Besides, the exegetical and theological predilections of the several translators have understandably colored their versions of the Latin text." This volume was included in the massive The Calvin 500 Collection from Logos. 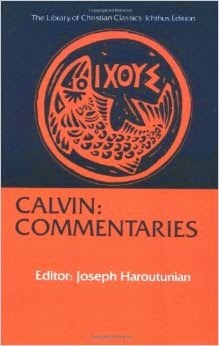 The old versions of Calvin's Commentaries are based on Calvin's Latin and French versions. The Latin versions were taken from the Corpus Reformatorum. This appears to be a link to a good chunk of the the Corpus Reformatorum.